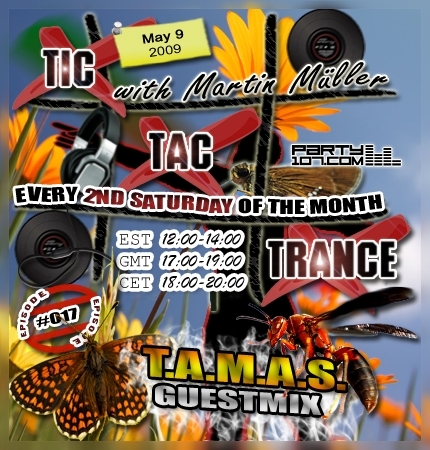 Tic Tac Trance #017 with guest T.A.M.A.S. Something special will happen in episode 17 of Tic Tac Trance on May 9. This time my show opens with an exclusive guestmix by T.A.M.A.S., known from his very successful radioshow “Stellar Sessions” on Sense.fm! My job for the second hour is to provide you with my current favorite uplifting and techy tunes. I will also spin some tunes from John O’Callaghan’s upcoming album “Never Fade Away”! Surely the web vote winner of the previous show shouldn’t be missing, so please don’t forget to tune in! My show starts on May 9 at 18 CET / 17 GMT / 12 EST. Check out your local time HERE!